... where anyone can ride a bicycle conveniently and comfortably to any place year round. This post comes just before the second Public Information Meeting about the 300 block of W. Wilson St. At this meeting there will be a presentation of alternatives for the 300 block reconstruction project that is due to be completed in the summer of 2019. This public meeting will be on Thursday, December 6, 7 pm in Room 260 of the Madison Municipal Building. After this meeting, City Engineering will present the proposed alternatives to the Transportation Commission along with whatever modifications they made to the alternatives based on public input acquired during and after the meeting. After the project clears the Transportation Commission, it will likely go to the Board of Public Works, and finally to the Common Council for approval. If you live, work, or bike in or around West Wilson Street and want to see conditions for people on bikes improve, consider attending the meeting on Thursday night. Figure 1: Bike routing and connectivity issues between the Capital City Trail and downtown. Although this post will be primarily about the 300 block of West Wilson Street, this will tie in with a series of posts about the importance of the West Wilson Street corridor, the Bassett-Broom one-way couplet that uses the 400 block of West Wilson, and how we can improve the connection between Law Park and the downtown area. The next post will focus on the reconstruction project of N. Bassett St. between Dayton St. and W. Washington Ave. There will be a public meeting on Tuesday, December 11 where alternatives to that project will be presented. The Capital City Bike Path, also known as the Isthmus Bike Path, greatly improved the pedestrian access to the lake shore, but there were still significant connection issues limiting access, primarily caused by the presence of U.S. highway 151 cutting its way through the isthmus. In fact, U.S. 151 must be crossed if one wishes to access the Monona lake shore from the southwest of Blair Street. Presently there are four pedestrian ways across this major barrier: A crossing at North Shore Drive, a crossing at Broom Street, the Monona Terrace bike elevator, and crossing at the John Nolen/Williamson/Wilson/Blair intersection more commonly known as “the hairball”. 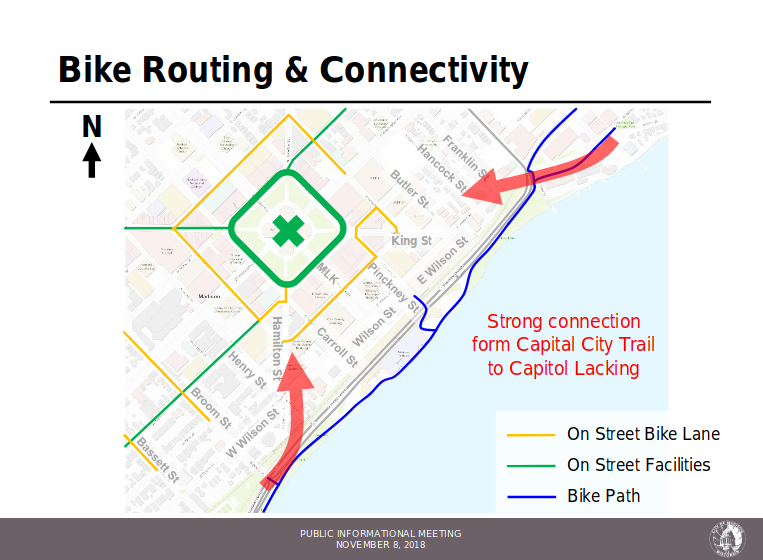 For someone desiring to bike downtown to the Capitol coming from the south, the Broom to Wilson Street connection is the most desirable option, however inconvenient due to the nature of the on-street connections. This connectivity issue from the south to the downtown area was highlighted in the November 8th Public Information Meeting for the 300 Block W. Wilson St. project, as seen in Figure 1, above. From the project’s web page, the City plans on resurfacing and replacing utilities on the 300 block of W. Wilson St. in the summer of 2019. This project presents a great opportunity to improve biking along the isthmus and to improve bike access to the downtown core. The current conditions of the 300 block of W. Wilson are a 40 ft. curb-to-curb width occupied by two inbound lanes and one outbound lane (Figure 2). Currently the only bike accommodations on this block are faded sharrows painted on the outbound lane. 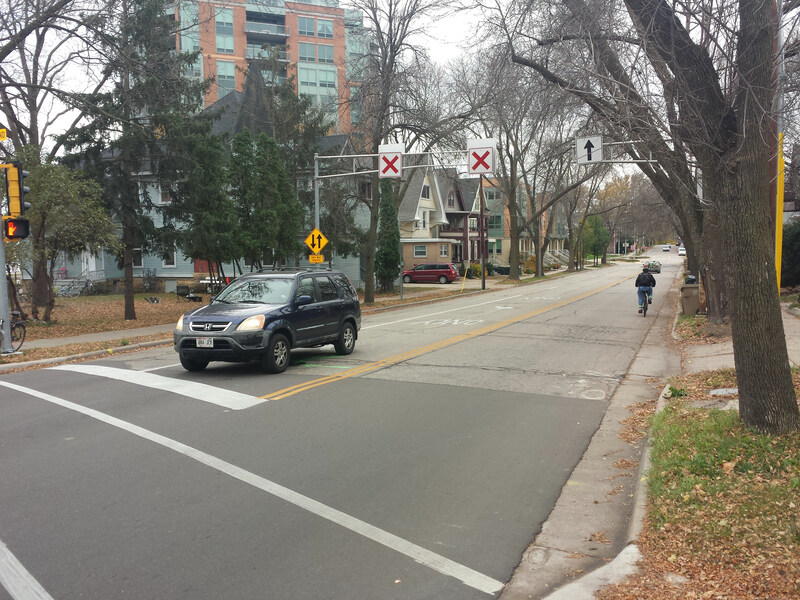 Figure 2: Current condition of the 300 block of W. Wilson St. A person can be seen riding in the outbound direction. From the same corridor study mentioned above, the City found that the traffic volumes for Wilson St. “have been relatively consistent for over 40 years”(Wilson St. PIM presentation, p. 6). During the course of the study, the city found an average daily traffic (ADT) volume of 3660 vehicles per day (VPD) inbound from Broom St. and an ADT of 4650 VPD outbound, with a majority of that traffic going to or coming from the John Nolen Drive causeway (Figure 3). The story is similar at the Hamilton/Henry/Wilson intersection with a clear majority of inbound traffic using Hamilton St. (3750 VPD) and a clear majority of outbound traffic using W. Wilson St. (4400 VPD). 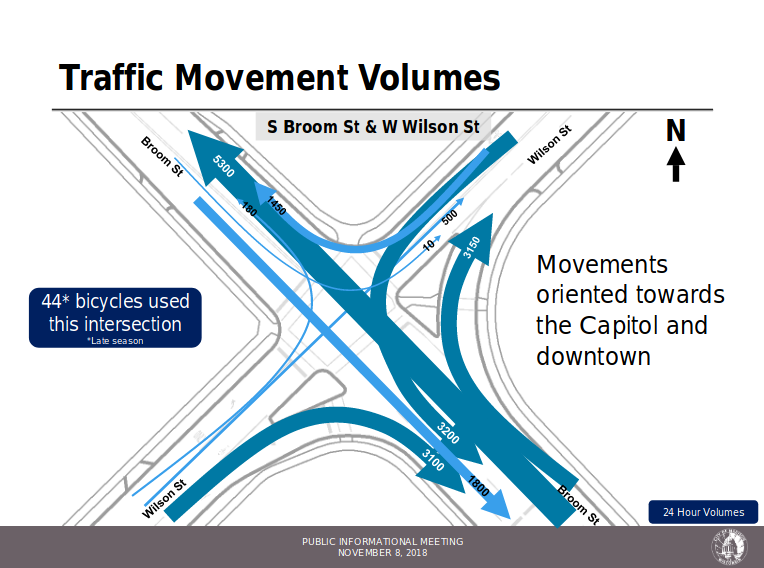 Figure 3: Traffic Movement Volumes at the Broom St. intersection with W. Wilson St. These usage trends would seem to indicate that we should rethink how W. Wilson works, at least on the 300 block. Using the available 40 ft. curb-to-curb width currently in existence, the 300 block of W. Wilson St. could be converted to a two lane street with 6 ft. bike lanes and 2 ft. buffers on both sides (Figure 4). This would substantially improve the bikeability of this corridor as apart from fully separated bike lanes similar to what N. Bassett St. got last year, buffered bike lanes provide a substantial improvement to the comfort and feeling of safety riders experience while using the facility. We have yet to see what alternatives will be proposed at the meeting, but we hope there will be at least one option that includes high quality bike lanes and an improvement to the Broom/Wilson intersection. Figure 4: What safe and comfortable bike facilities could look like for the 300 block of W. Wilson St. as mocked up in Streetmix. Further improvements to the connection between the Capitol square and the Capital City Trail to the south should reconsider how W. Wilson St. is used Hamilton and Blair. For one, the Judge Doyle Square project, which includes a Bicycle Resource Center, will be best accessed via this corridor. There is also a planned pedestrian/bicycle bridge over John Nolen Drive east of the Monona Terrace which will intersect with W. Wilson St. just west of the King/Weber/Wilson intersection (Figure 5), which is currently a one-way only for all vehicle traffic. Finally, since topography is a legitimate concern for people riding bikes, it is important to note that the grade of W. Wilson St. from the south is far more favorable than Hamilton St., as seen in Figure 6. This would seem to suggest that allowing eastbound bicycle access on Wilson St. between King St. and Hamilton St. would benefit people wishing to access downtown by bike greatly. 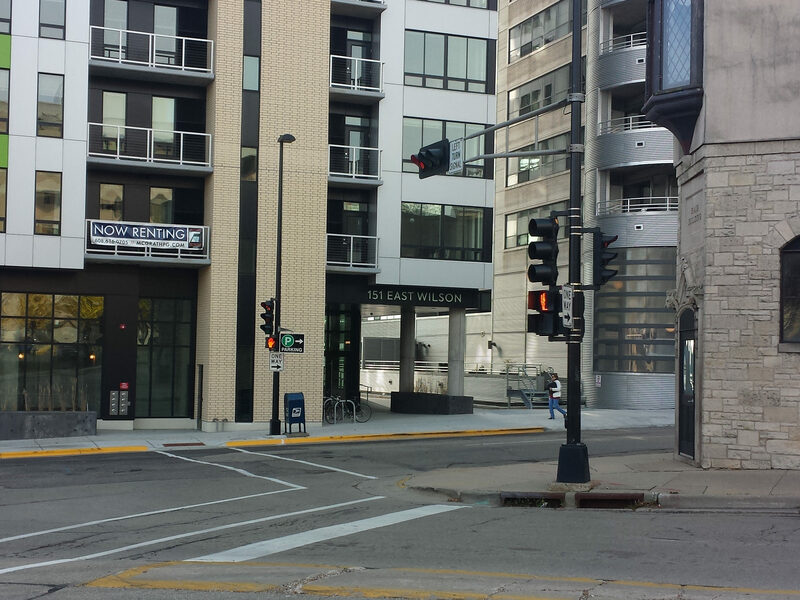 Figure 5: The easement for the future pedestrian/bicycle bridge over John Nolen can be seen just to the right of the new building at 151 E. Wilson St. In the future, the city is considering constructing a bike path connection on the north side of the railroad between Broom St. and Hamilton St., however this does not address the need for a bike facility on W. Wilson St. itself. For one, it neglects people wanting to bike who are inbound on W. Wilson St. from west of Broom St. It also neglects to consider bicyclists who reside on the 300 block, and any visitors they may have. Finally, since this is still in the conceptual stage, it would not provide any improvements to downtown access for many years, while improvements to W. Wilson could happen much sooner. Figure 6: Comparison of average grade of S. Hamilton St. between Wilson St. and Main St. with the average grade of W. Wilson St. between S. Hamilton and Martin Luther King Blvd. Follow Madison Bikes on Facebook or Twitter. Sign up for our newsletter or subscribe to the blog RSS feed.